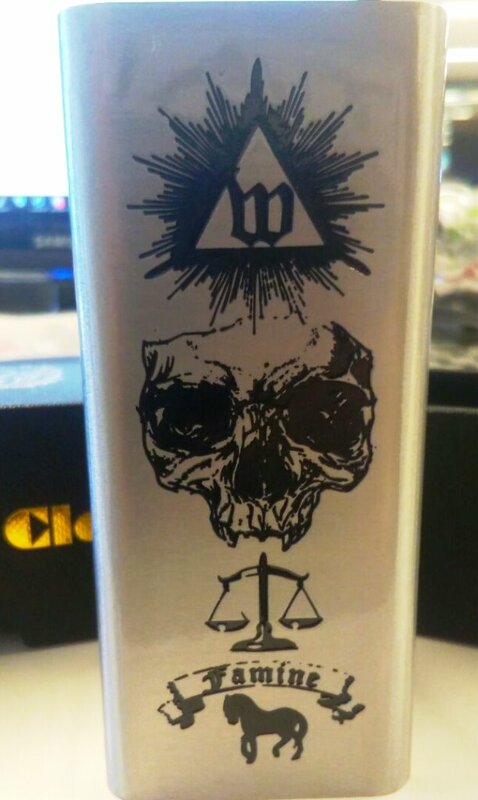 Hi All, Anthony Vapes back here with my review of the Wismec Luxotic MF Mod. Please see bottom for disclaimers and links. Note: this was marked as a sample version. The Wismec Luxotic MF Mod is a newer mod from popular vape manufacturer Wismec. Their newest is the Wismec Active which i’ll get to later this year but first come first serve. The MF stands for Multifunction as the luxotic MF has tons of options. It can be used as a single 2×700 squonk mod or as a dual 18650 parallel mod. It features replaceable chips as well coming standard with a basic 100 watt regulated chip with the standard wismec feature set as well as an optional DO (Direct output) chip you can swap out making it like the Luxotic BF mod or Aspire Feedlink Mod. The review sample comes with both chips. Looking around online i see it listed around 30-50 USD depending which chip you buy it with and the DO chip being sold around 10 USD or a standard chip for around 20 USD separate. It also comes in a kit version with the guillotine 2 RDA but i already reviewed that so won’t be touching on that today . It’s available in 2 colors, Black and Silver. When I first got this Mod, i found it to be pretty interesting. It has a few ways it can be used. The review sample came with both the standard 100 watt adjustable chip as well as a non adjustable DO (Direct Output) chip. Any version you get can be used as a dual 18650 parallel mod or a single 2×700 squonk mod. The main point from what I heard was that they wanted a user serviceable mod to sell for places where it’s hard to find vape stuff so people can repair them themselves. It does make some sense in that regard but still doesn't explain the DO chip where it could be done without that. Either way wasn’t really sure how to feel about this mod from the start but figured it would make the most sense to use as a since 2×700 squonk mod however i also used it as a dual 18650 parallel mod as well. Now let’s get into some data. I ran my normal testing. I only tested in single 21700 mode, I used Samsung 30T 21700 batteries for the testing. Testing resistances were done at .12, .14, .19, and .57 ohms. wattage points were max (100), 80, 60, 40 and 20. At .12 ohms it maxed out at 78 watts and 25 amps. For the rest of the testing it hit quite weak 4-18 watts. It struggled a bit with the low resistance. At .14 it maxed out at 86 watts. The rest were again pretty weak anywhere from 2-9 watts. For the .19 test it maxed out at 93 watts. Much better than the lower resistances but still slightly weak 1-5 watts. For the .57 testing it maxed out at 106 watts and 7.784 volts. For the rest of the testing it was a little high 1-5 watts. The volts shows there is a boost circuit in this mod like most single battery mods have. For the DO chip, I tested it at the same 4 resistances. With a .12 i got 78 watts which is the same as using the standard chip turned all the way up. With a .14 I got 76 watts which was 12 fewer than the standard chip put out max. With a .19 I got 63 watts and with a .57 i got 27 watts. Mod performance is just ok. Hits mostly weak and works best at low watts or above .19 ohm. Accurately rated for watts (106), Yes boost circuit, lower side of average amp limit of 25. Volts tested at 7.784+. I’ll keep it short and sweet. It’s typical wismec temp control so not good. This really needs to be fixed. Myself and many others have been saying this for years but they don't want to listen. I don’t know how else to say it. Doesn’t even stay in TC mode without kicking you out. It’s on par with the longstanding reputation of terrible TC from wismec and really needs to be addressed. This is getting old and annoying to me personally. The mod uses a standard 5 click to turn on and off. The Menu is pretty simple. 3 clicks to enter the menus which lets you pick from wattage, bypass, TC for NI200, Ti, and SS and 3 TCR memory modes. 2 clicks to enter the menu of turning the logo on or off. Fire and down for stealth on, up and down to lock adjustment buttons. With the mod off, up and down flips the screen, Fire and down shows live battery voltage, fire and up lets you program the TCR values. Typical wismec menu but i wish they would update it better. I mean having to turn the mod off and then hold buttons just to adjust a TCR is archaic at best but not greatly annoying since TC doesn't work anyway. Also a few times i encountered an issue where it would give me an atomizer short and refuse to fire. Popping out the battery and putting it back in fixes it. Seems more like a glitch that only happened a handful of times but still very annoying. The paint on the mod is good. I have the black one. No wearing or fading outside of the bottom which is pretty normal. It’s a basic looking black mod, nothing great but nothing bad either. The fire button is nice and clicky and a decent size. It’s a simple black square with no texture on it. The 510 pin gave me no issues and every atomizer i used on it worked great with no gaps. The mod handles 25mm atomizers without overhang. The screen is a basic “DNA style” black and white screen. It’s on the small side for mods these days. I’d like to see better screens personally. This mod doesn't have USB charging which i understand due to the different battery configurations it can take. Still if using a single battery mod it’s nice to have one even though i prefer charging externally and just swapping out batteries personally. So with all that said, do I recommend this mod or not? I don’t like to do a hard yes or no but this one has to lean towards the no. It’s more of a “jack of all, master of none” mod that tries to do too much and doesn't really nail any of it. It is cool you can easily replace the chip but outside of that it’s a lower tier single battery squonk mod with some annoying issues that probably only beats out the anita and no other one’s on the market. It’s nothing i can put my name on personally so I won’t be adding it to my sheet of recs linked down below. I’ve been doing vape reviews since late 2016 and have done around 250 reviews to date. I enjoy helping vapers on forums as well and helping contribute to the great vape community. I’m not an “out of the box” reviewer. I do my best to be thorough at all times and have enough experience with many products to tell what’s good and what’s not. All mods get tested with an oscilloscope and stress tested and results are posted in my reviews.